The fastest Kabylake processor Core i7 7700K will try to stand against the 8 core/ 16 thread ZEN in the early 2017. It has no chance at all, it will be eaten for breakfast by ZEN in all apps besides the heavily optimized AVX/ AVX2 ones. Of course Kabylake has an iGPU inside where ZEN 8 core/ 16 thread will be a CPU only SoC. But that's a problem of Intel to release 8 core CPUs without iGPUs for mainstream Core i7 and not for the High-End Desktop (HEDT) terribly expensive systems only. I know I always enjoy reading your off topic delusional AMD fanboy posts. Please keep it up. Zen will lose in 99% of games because it cannot compete with the IPC+clockspeed of Kabylake. Just one example where you are wrong. I'm not so sure about games like you. Because new games using Vulkan and DX12 tend to use more and more cores and threads, it will be an interesting fight with games. In office applications, production applications, rendering, general purpose benchmarks and Cinebench it will vanish Kabylake for sure. Doesn't matter really. Over 99% of the games will still use DX11 or even DX9 by next year. And for non gaming apps there is lots of stuff where you don't see improvements over 4 cores. It would be very very sad if a 8 core CPU can't demolish a 4 core CPU in Cinebench. This isn't a fanboy thread for AMD CPUs, you may search for another place to discuss this further. 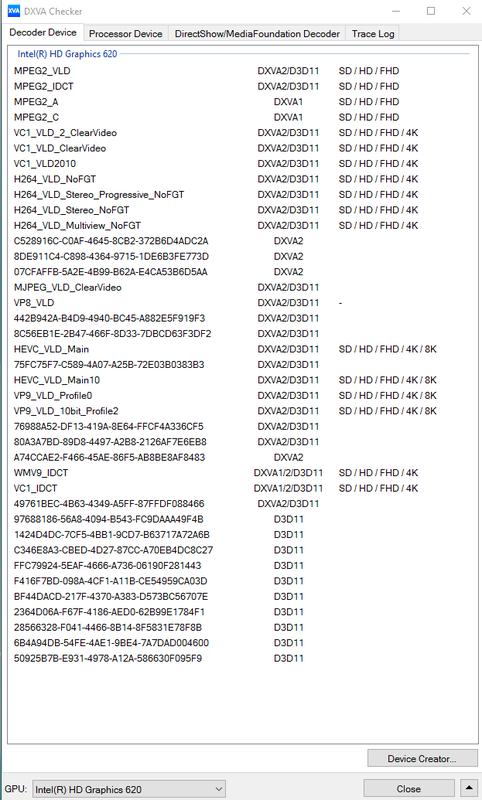 HEVC Main 10 as well as VP9 Profile 0 and 10 bit are now decoded up to 8k. While Intel as well as Nvidia are running, the disadvantage of low resources to work with you could guess. Overall Polaris DSP really looks like just being in the R&D state of the Previous VPX (Maxwell) and Intel far far ahead of both again (Tegra,Maxwell,Pascal,Polaris). I really wonder how much sense it really makes to keep that fixed function unit of Nvidias and AMds in a Intel System it makes no real sense efficiency wise especially in the upcoming Kaby Lake Systems it's just pure unneeded overhead on the discrete side and the valuable Wafer space could be used for more 3d and compute logic or to make the grid even denser. I guess AMD has planned to release/enable VP9 Decoding support officially with the upcoming Polaris 10 Notebook Reviews and supplied Drivers. Last edited by CruNcher; 3rd September 2016 at 01:43. Yes, but is the late Polaris VP9 decoder a fixed-fuction decoder like Maxwell's with 960 card which Nvidia enabled some time later than the initial release of 960 or a hybrid decoder ? Of course as long as Chrome official releases don't support VP9 HW decoder, all the other uses of VP9 are insignificant. Only Edge supports VP9 HW decoder. But the difference between a hybrid and a HW decoder is not insignificant. It makes complete sense considering Intel has only just delivered a Hardware decoder for HEVC 10-bit, VP9 when you could have had one from NVIDIA all the way back in January 2015 (VP9 Enabled in December 2015). Plus nobody upgrades their CPU that regularly unlike GPUs because it's a waste of money. I really like all of you guys that after you tell me your off-topic story you call me for writing off-topic. But you really overcome everyone here by telling me what to say in my own thread and to search somewhere else to write. It couldn't be more funny. The truth is that AMD is going to kick for good some @sses and all the fan boys of Nvidia and Intel are desperate and nervous. Vega will just destroy Pascal for sure, it's another class it will show no mercy. The same thing is gonna happen to Kabylake. All of the AAA titles are already DX12 and Vulkan or they are going to get a patch soon. The rest of the games are simply not interesting. Most of the apps nowadays are getting a serious boost going hyperthteading, meaning getting 8 threads for 4 real cores. Just imagine how fast will be 8 real ZEN cores with 16 threads. 2017 will be the year of AMD. Very funny joke . Today is 1 April??. You must very "love" AMD, if you realy believe in this. Last edited by rbej; 4th September 2016 at 07:50. What would currently be the most cost effective solution to build a Windows 10 based HTPC, with 4K and HEVC decoding capabilities? I ask here since you seem to be trying all combinations. Thank you. the cheapest card is the rx 460. for UHD presentation you should get a GPU with at least 3GB of vram. I disagree with rx 460....the better card would be nvidia gtx 1050 (4gb variant, not yet released) or 1060 3gb. Don't forget Pascal series support HEVC 8,10 and 12 bits decoding in hardware. Beside, it has been confirmed through nvidia Video Codec SDK that pascal also support VP9 Profile 0 decoding in hardware too. AMD Polaris only supports 8 and 10 bit HEVC....and there is conflicting info about vp9 support whether it is hybrid or full fixed hardware mode. Last edited by JohnLai; 7th September 2016 at 06:33.
you should read the question. and the RC 460 is not the cheapest card that can decode HEVC? Cheapest but not the best value for video decoding functionality. so card for double the money that can theoretically decode 12 bit which isn't even part of the DXVA spec is better? Maybe good for 4k h.265 @60fps while 960/950 are better. I would get 1050/1060 for video or waiting for Kaby Lake. What make you think Microsoft won't update the spec? there is no commercial 12 bit content. even if they are adding it you are unlikely to really need it any time soon. the last CUVID "update" i know of was just a repack. CUVID has some serious issues on windows 10 on top. the problem that only nvidia can do it in theory will slow this down too. commercial product will stay away from it for better compatibility.